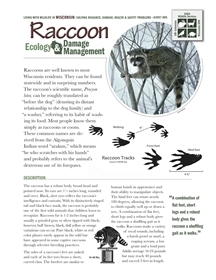 In this, the fifth publication in the “Living With Wildlife in Wisconsin” series, the authors describe the life, habits, and habitat of the raccoon, that clever creature whose versatility and energy can make him both entertaining and troublesome. The authors describe the economic and ecological benefits provided by raccoons. They also describe how to identify raccoon damage, and how to deal with raccoons that are residing in your attic, exploring your chimney, pulling down your corn stalks, ransacking your poultry house, or raiding your bird feeder (8 pages; 2012).